This Bambi swimsuit is what you need and it has long sleeves to keep you arms out of the sun. This women’s swimsuit is black and on that you find Bambi, Flower and Thumper. On the back this Bambi bathing suit has a zipper so that it is easy to put on and off. You can find the fun Disney design on both the front, back and the sleeves and that will make you feel like you are part of the story. Long sleeves are great for a bathing suit specially if you like paddle boarding or other water sports. Snow globes are so much fun specialy when you turn them over and the snow flakes start to tumble down on the amazing scene inside the ball. 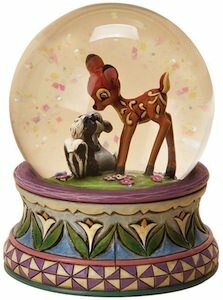 This snow globe is made by Jim Shore and shows a scene from the Disney movie Bambi. It shows a grassy plain with some flowers and Bambi and her two friends Flower and Thumper. And not only is the scene in the globe fun to look at even the snow globe base has amazing details and it really makes this a special item to have. 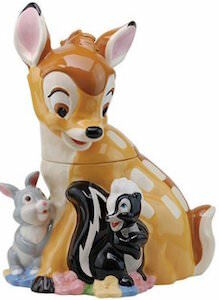 Come and have a closer look at this Disney Bambi Friendship Snow Globe.